SAN FRANCISCO -- Activists seeking to recall a judge who sentenced a former Stanford University swimmer to six months in jail for sexually assaulting an unconscious woman say they believe voters will still support the effort even if it appears on the ballot two years after the trial. The case drew national attention when critics decried the sentence as too lenient. 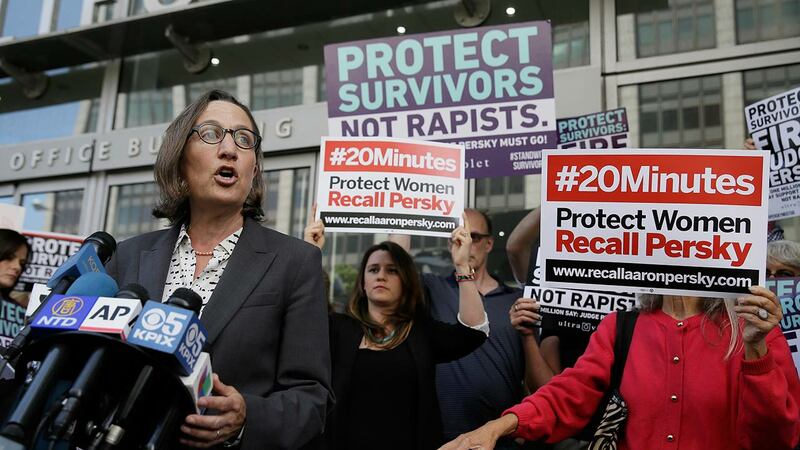 The activists, led by Stanford University law professor Michele Dauber, filed paperwork Monday with the Santa Clara County registrar - the first formal step toward winning the removal of Superior Court Judge Aaron Persky. This is an undated image of Judge Aaron Persky, who presided over the controversial Brock Turner trial. The group will have 160 days to gather the nearly 59,000 signatures of registered voters needed to qualify the measure for the ballot next year. Brock Allen Turner could have faced up to 14 years behind bars for sexually assaulting the woman who had passed out behind a trash bin near a fraternity house. Prosecutors argued for a six-year sentence after a jury found him guilty of three felony sexual assault counts. But Persky sentenced Turner to six months in jail, citing the "extraordinary circumstances" of his youth, clean criminal record and other considerations. Turner was released early for good behavior and only spent three months behind bars. Brock Turner, the man convicted of sexual assault of an unconscious woman on Stanford's campus, released from Santa Clara County Jail, San Jose, Calif., Friday, September 2, 2016. Court documents show that Persky has given lenient sentences to at least two other student athletes and made unorthodox decisions to accommodate the college football players' schedules - decisions that made it easier for them to duck court oversight. Persky did not respond Tuesday to an email request seeking comment. The California Commission on Judicial Performance, which oversees judicial discipline, ruled in December that Persky committed no misconduct in the case. Still, Dauber said the "intense outpour of public unhappiness" still resonates. Activists hoped to launch the recall campaign soon after Turner was sentenced a year ago. However, county officials told them that launching the campaign then would cost taxpayers too much money and advised them to target a recall vote on the June 2018 ballot. Santa Clara County District Attorney Jeffrey Rosen opposes the recall, but he said in a statement that Persky's sentence was wrong. Still, the attention should not be on one judge but rather on finding concrete ways to help victims of campus sexual assault, Rosen said. A group known as Retain Judge Persky said in a statement that every judge has made an unpopular decision. "Judicial recalls are an extreme step that should be reserved for actual misconduct," the group wrote in a prepared statement.